Holidays are the perfect time to raise funds for the ultimate gift: An educational adventure of a lifetime. To aid our students in their fundraising endeavors, we’ve created new tools to ease their efforts. E-cards make it simple for family and friends to give the gift of travel. Students can email as many E-cards as they like and customize their message to share fundraising goals and highlight the amazing destination they’ll be visiting. 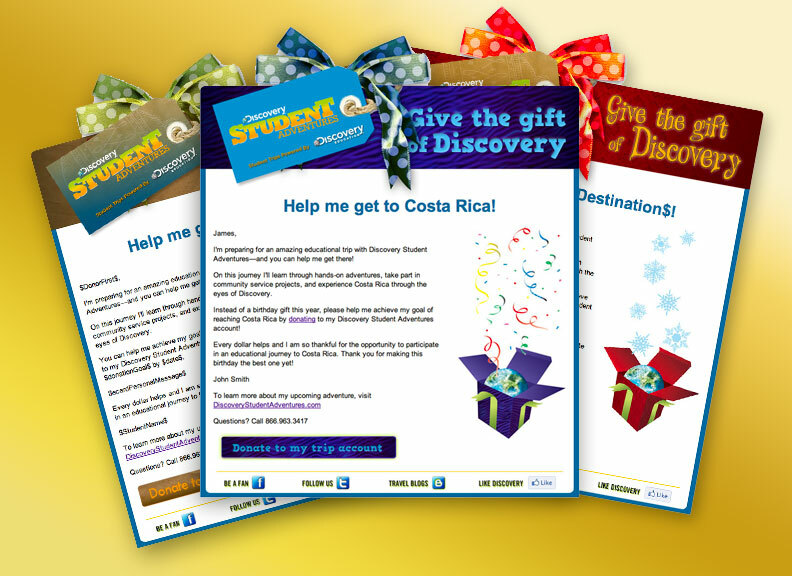 The email recipients can easily make a donation directly to the student’s trip account. A fundraising calendar provides great inspiration and can help maintain momentum through the year. Planning is key to meeting your fundraising goals and what could be better than a tried and true idea for every month? December is a great month to hold an event. Caroling, bake sales, Christmas trees, oh my! Packing lists are chock-full of good gifts. Don’t have a pair of waterproof, closed-toe shoes for that night hike through the rainforest? Check off the items you have and note what you need. Sometimes, it’s more meaningful for friends and family to give a gift that’s tangible and useful instead of money. Travel gifts can be used long after the gift wrap is torn away. Enrolled students have access to these great tools in their Travel Center. What kind of travel gift would you like? Good Fundraising Ideas Shoutfund is the only do-it-yourself online social networking, fundraising website.We provide each member with a fun and effective platform to express their ideas, causes and projects.